I took a long weekend off from work to meet an old friend of mine up in Santa Barbara. I had not seen Lynn in quite awhile, so it was good to finally catch up. On Saturday night, we took a short walk from the hotel (or long walk, in my opinion) to a small little Mexican restaurant. We didn't actually know where the place was located. Lynn got the general directions from someone she works with. A place where all the "locals" go. We finally found it when we stopped at a liquor store to try to get directions. The clerk had no idea what we were talking about, but there was a woman in the store who helped us out. We persevered up the street and finally found the place. 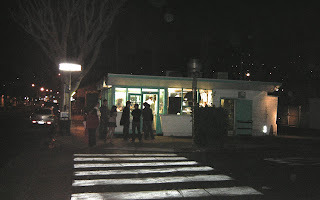 What it lacked in ambiance, it made up for in great food. It is apparently a secret place, so I can't really tell you the name or exactly where it it. If you are interested, look for the "taco stand with the blue awning next to an empty lot with a long line coming out the front door." 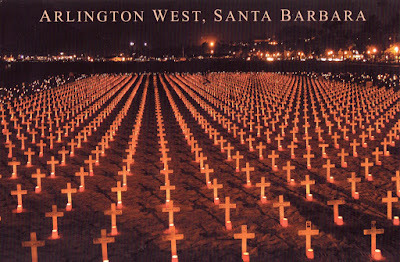 Today, we walked up Cabrillo Blvd to State Street to see this memorial on the beach. I came across this cross in the front. It caught my eye because Porterville is not very far from my hometown. I spent many summers at my aunt and uncle's ranch in Porterville when I was young. 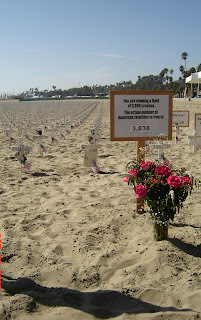 Mike Mitchell was only 25 years old when he died in Iraq. It simply makes no sense to me. Maybe it will when we move on to attacking Iran.